Saving water can be done in the kitchen, in the bathroom, and outdoors. Saving water is as simple as installing low flow fixtures in place of older ones, finding leaks, and using water efficiency tools. In the average American home, 45% of the total water usage occurs in the bathroom, with about 27% of that being used by toilets. Fortunately, your household can decrease its toilet water usage by checking and fixing leaks and retrofitting toilets. In 1994, The Energy Policy Act became a law and mandated a maximum flush volume of 1.6 gallons for toilets manufactured and installed after this date. If your toilet is more than 23 years old, chances are that it is using between 3.5 – 7 gallons of water with every flush. Over the last twenty years, there have continued to be efforts to decrease the amount of water used in toilets. There are high-efficiency toilets that use 1.28 gallons per flush or less. You may also be familiar with dual flush, grey water, or composting toilets. However, if you are not ready to install new toilets, you can retrofit the ones you have. 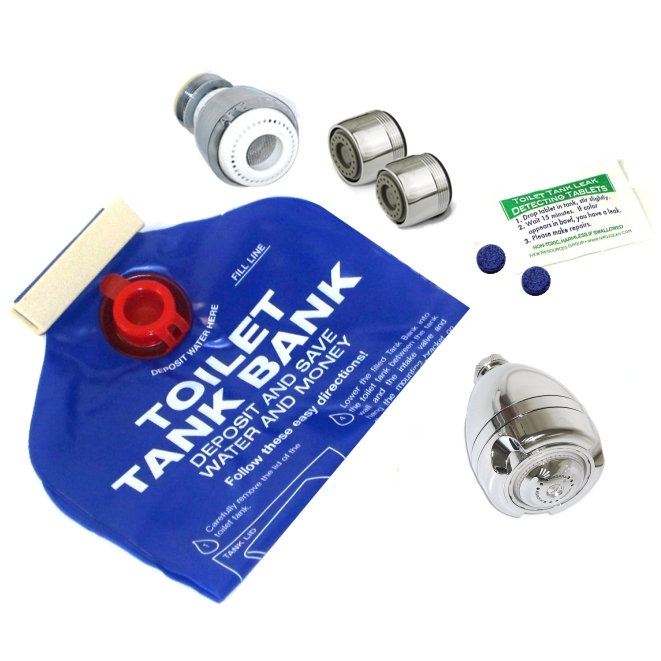 An easy option is to install a toilet tank displacement bag in your toilet tank. Once filled with water, the bag will displace about .5 gallons of water in your toilet tank so that it will use less water each time it is flushed. Another option is to install a fill cycle diverter. The fill cycle diverter is a plastic device that directs more water to the tank and less to the bowl while they refill so that they finish filling at roughly the same time. When a toilet is flushed, both the tank and the bowl need to be refilled, and in many cases the bowl will fill sooner than the tank. In this case, the water will continue to run into the bowl until the tank water level is high enough to shut off the fill valve. Once installed, a fill cycle diverter will save about .5 gallons of water with each toilet flush. 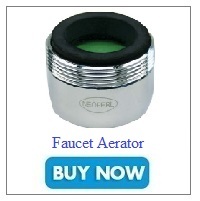 It can be used in conjunction with the Toilet Tank Bank. A third option is to install a new toilet fill valve. The Hydroclean toilet fill valve is the only valve that solves the two biggest reasons for water loss in toilets – miscalibration and leaks. 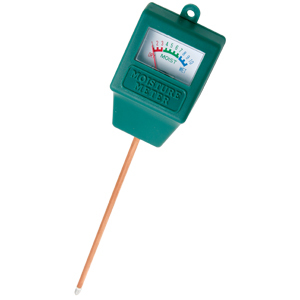 The patented mini-valve allows pinpoint calibration typically saving 30-ounces of water per flush in high efficiency toilets and 60-ounces per flush in older, larger toilets. 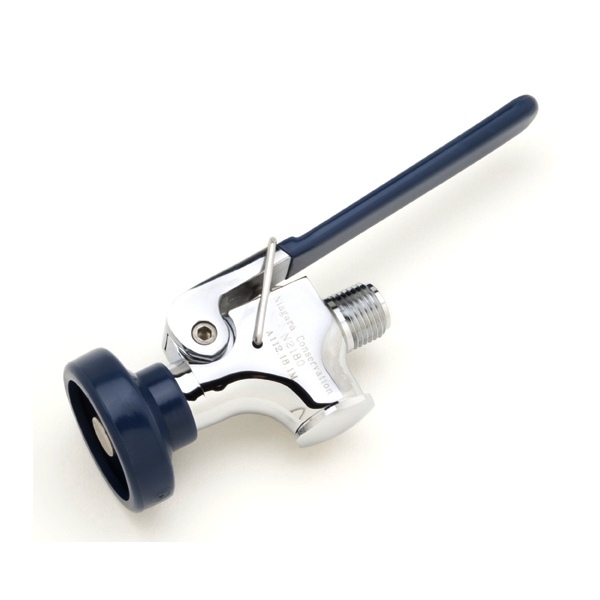 Its’ unique bowl filler adjustment also detects silent leaks and the patented Float Lock allows minor repairs in the tank as well as flapper leak detection without shutting off the water. 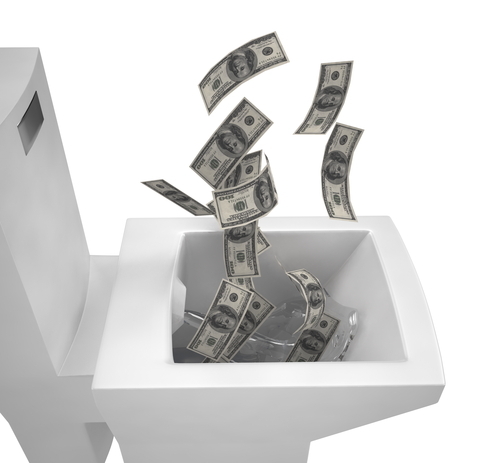 Simple, inexpensive retrofits for your toilets will allow you to save both water and money! How much water can I save by switching to WaterSense Labeled Pre-Rinse Kitchen Spray Valves? WaterSense labeled Kitchen preâ€“rinse spray valves, which are designed to remove food waste from dishes before dishwashing, can save you more than $115/year in water and energy (natural gas or electricity) costs. Often used in commercial or institutional kitchens, these valves can account for up to one-third of water usage in the average kitchen. By switching to a WaterSense valve, costs for accommodating this water usage can drop significantly. While the federal standard for commercial pre-rinse spray valves is 1.6 gallons per minute (gpm), EPA’s specification sets the maximum flow rate for WaterSense products at 1.28 gpm. Because of this, manufacturers have now developed models that use 20% less water than the federal standard–a significant decrease, such as the 1.28 gpm Prerinse Kitchen Spray N2180. EPA’s specification also includes spray force criteria and lifecycle testing to ensure performance in commercial kitchens. To make customers select products that best suit their applications, all WaterSense labeled spray valves are required to include spray force on product packaging and are independent certified to ensure efficient use along with water conservation. Just by replacing one pre-rinse spray valves with a WaterSense labeled model, an average commercial kitchen can save more than 7,000 gallons of water per year. When you factor in the hot water used to rinse dishes, switching to a water-saving pre-rinse spray valve can save a commercial kitchen’s natural gas use by more than 6,400 cubic feet per year as well. Across the country, we could save over $225 million annually in water and energy costs if all commercial food service establishments used WaterSense labeled pre-rinse spray valves. Start saving today. Daily water usage racks up your water bill fast, especially in the summer heat. Sometimes it may be hard to even recognize how much water we use in a day because of our busy schedules. 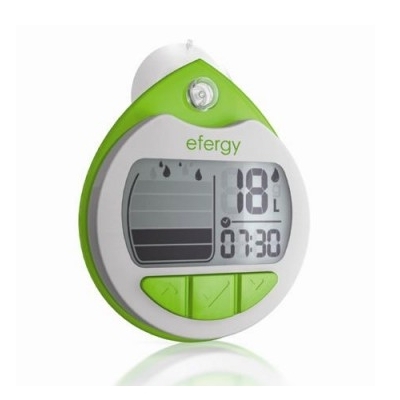 Lets be honest, at the end of the day when you get home from work and prop your feet up, your water bill is probably one of the last things on your mind.Â So, how is a household or a business supposed to be able to monitor or reduce their daily water consumption and find the time in such a fast paced world? There is a simple solution to this. 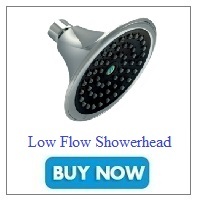 At Conservation Mart, we have an inexpensive way for you to conserve water. 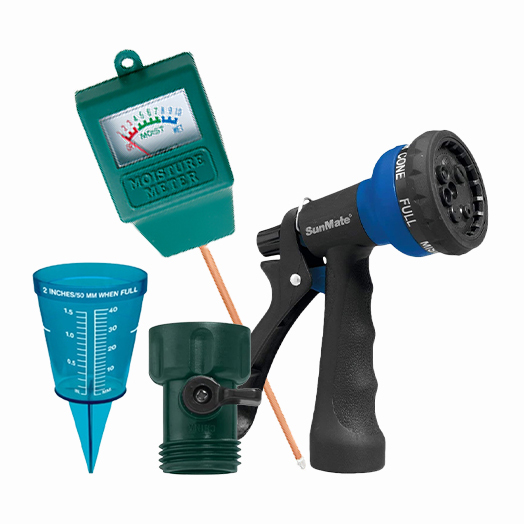 We carry water savings kits that are catered to indoor and/or outdoor use. Both indoor and outdoor water saving items are easy to install (if installation is even needed) and start conserving water instantly! (Which means a lower water bill for you.) 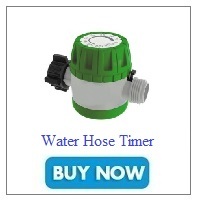 Visit our site to view all of the water saving kits available. Using these products to conserve and save is the perfect solution in this fast paced world!